Bedtime Stories ⋆ Chilli Marketing Ltd.
One of the key differences between public relations and other marketing disciplines is that, while all others are demanding straight-forward communications and direct responses, PR is more on the 『soft』 side. Living on the soft side doesn’t mean life is easy. PR executives always feel like torn between clients and media. While heavily branded stories appealing to clients are often of thin chances in successful pitches, those appetizing to editors are usually commented to be 「too soft」 by clients. Are there any tool-of-the-trade techniques in successful media pitches? Yes, there are. Don’t approach media, be them newspaper editors, reporters or independent bloggers, only when you have assignments. Treat them as your friends, send them Christmas cards and add them to your Facebook, g+ or Linkedin network if they don’t mine. Take time, a lot of time, to study and understand your clients』 brands. From their history to the finest details of their products or services. It helps you discover unique and sound press angles way easier. A punchy headline and an interesting featured image always count. Don’t be upset if you are to work on a 「flat」 story. By giving a relevant yet interesting headline and photo, the consequence can be very different. 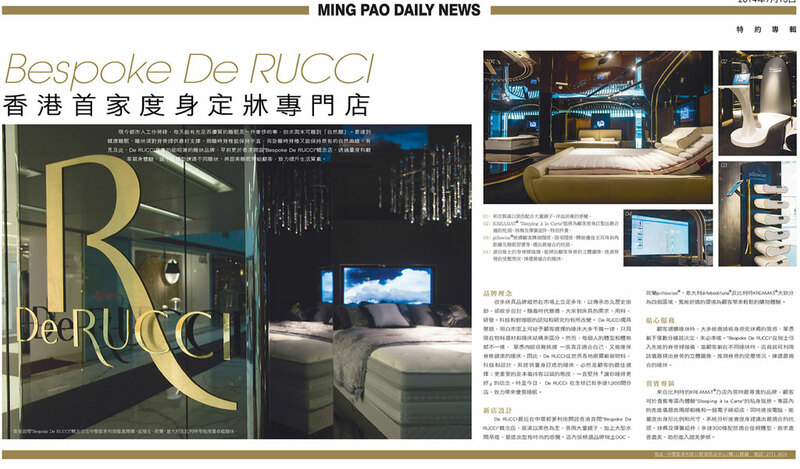 Recently we worked with De Rucci, a sophisticated bedding brand, on their launch in Hong Kong including crafting of various angles in media pitches. Though the brand is relatively young in the market, a very sound media atmosphere was created during the launch period – thanks to the great insights from client and the strong efforts our team put into studying the market and the brand’s core essence.